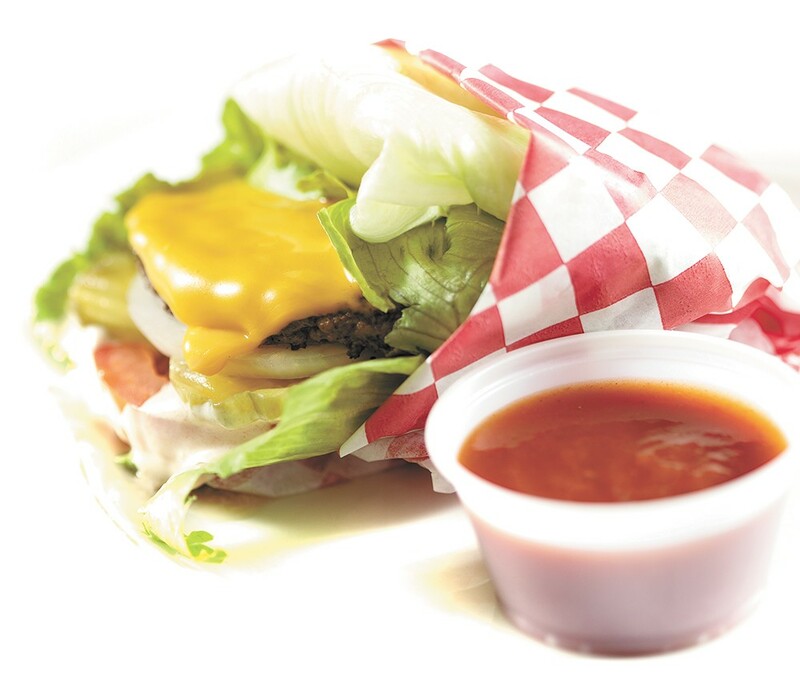 The Surf Shack's lettuce-wrapped burger features ketchup made without high-fructose corn syrup. When brainstorming places to dine out on the cheap, it's fairly easy to settle for fast food, deep-fried fare and greasy pizza. The most inexpensive food seems to be on a mission to clog arteries and fog minds. If you want a real challenge, try to find a low-priced, healthy meal. That's the daily struggle for upstanding, health-conscious individuals. You're not likely to find any kind of health-food feast on the cheap, but these good-for-you options will fill your belly and feed your cells. They taste yummy too. Salad is often the light, go-to option when scanning a restaurant menu, and with the right toppings it can hold to that reputation. But a kale salad will beat the nutritional value of iceberg or romaine any day. With loads of vitamin A, C and K and tons of minerals, kale is considered one of the healthiest vegetables around. Yards' kale salad is topped with protein-rich pine nuts, shaved onion, parmesan and a tasty honey-lemon vinaigrette. Sure, frozen yogurt is a delectable dessert, especially if you're heaping candies, chocolate and sugary cereal into your cup. But you can change your m.o. to get a healthy snack — or even breakfast — from this self-serve fro-yo joint. Low in fat, frozen yogurt is high in protein and digestion-aiding active cultures. Fresh berries, bananas, pineapple, almonds and granola sit among Froyo Earth's topping choices. Just walk past the Reese's Cups and caramel syrup and don't look back. Everything on the menu at the recently opened Ephata Cafe is under $7, and it's all healthy, too. A filling plateful of mixed-grain rice, onions and your choice of beef, spicy pork or tofu make up the Korean rice bowl, which also comes with a side of kimchee or fruit. The rest of the mostly Korean menu features items like cold noodle soup loaded with vegetables and fruits ($6.95), organic house salad ($3.95) and seaweed ($1.50). The juice bar has fresh-squeezed mixtures of celery, kale, spinach, apples, oranges and more ($4.50). Admittedly, burgers and French fries generally don't appear on health-food lists. But at The Surf Shack in Coeur d'Alene, you're going to get both, in one of the healthiest ways it can be done. At no extra cost, get your burger bunless and wrapped in lettuce. It comes with an extra-thick tomato. Go ahead, get the fries, too ($1.89). They're fresh-cut and you can dip them in housemade ketchup, made specifically to be free from high-fructose corn syrup. Instead of a soda, gulp an infused tea ($1.59).